There is a great deal of debate about what should go into a salade Niçoise. Tuna or no tuna, new potatoes or no potatoes. Some people add anchovies and capers. Some add broad beans. Others hold off on the egg. 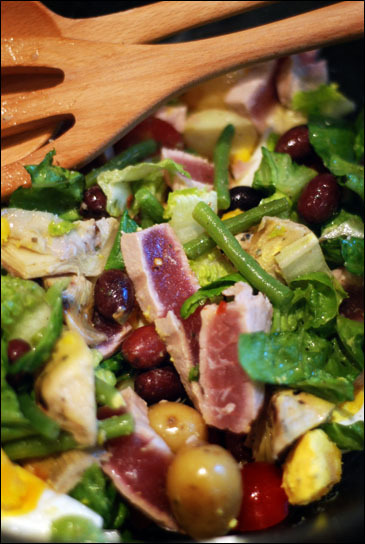 For me though, salade Niçoise is not the same without juicy riviera olives, marinated artichokes, green beans, baby new potatoes and seared tuna. Tinned will do, but really good fresh tuna, I think, makes the dish. Lashings of vinaigrette should go without saying and you will have an indulgent salad fit for a king (or queen). First, put the potatoes and the eggs on to boil, followed by the green beans. When the beans are done (about 4-5 minutes), blanch them by running them under cold water and set aside to drain. In a large salad bowl, put the shredded kos lettuce, riviera olives, cherry tomatoes and the artichoke hearts, which you may want to halve or quarter. Then, add the beans and, once cooled, the potatoes and dress with lashings of vinaigrette. Next, using either a frying pan or a George Foreman (I used the latter), sear the tuna - if frying, for about 30 seconds on each side, or until there is no pink showing top and bottom, but it is still quite pink in the middle. Slice the tuna and toss into the salad. Finally, peel and quarter the eggs, place on top of the salad and serve.